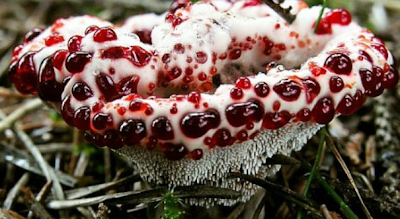 The Bleeding Tooth fungus - Hydnellum peckii is a rather gruesome looking fungus found in North America, Europe, and more recently discovered in Iran and Korea. Its most outstanding feature is the blood-like substance that it exudes from the pores, and while it is not toxic, it tastes so peppery and bitter that it is rendered unpalatable! Of course, discovering this information would have required some poor soul to eat it, or at least attempt to eat it - I sorely hope they got paid! The 'blood' is only really produced by the fungus during its juvenile stage, and contains a pigment known to have anticoagulant properties. 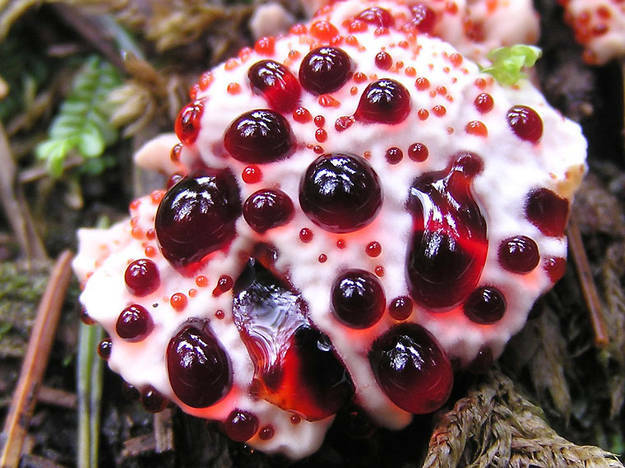 The bleeding tooth fungus is found growing solitary, scattered, or clustered together on the ground under conifers. Research has shown that it has a mutualistic relationship with the roots of certain conifer species, in which the fungus exchanges minerals and amino acids extracted from the soil for fixed carbon from the host. Remember, while it may look a bit like a jam filled cake - it is not a cake so don't try eating it. The end. What would be the ideal environment for me to grow these at home?